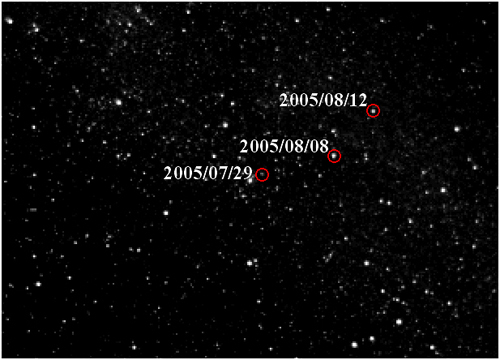 TOP > Topics > 2005 > Hayabusa performed the Star Tracker imaging of Itokawa! For almost two years and three months after the launch in May of 2003, Hayabusa spacecraft has traveled a long journey by way of Earth gravity assist in May of 2004, and will make a worldÍs first low thrust rendezvous with a near-Earth asteroid Itokawa next month. Hayabusa performed the Star Tracker imaging of Itokawa on July 29-30, August 8-9 and August 12. Totally, 24 images were taken and the hybrid navigation combining both radio and optical measurement was performed and the results came out enough well to guide the spacecraft making a final approach to the object. The optical navigation at very slow approach speed under ion engines propulsion is what Hayabusa has demonstrated for the first time. The exposure of Optical Navigation Camera (ONC), a high resolution imager, is also planned one or two weeks later. Hayabusa carries three reaction wheels aboard. There was an incident on x-axis wheel, whose friction exceeded a driving torque on July 31 and stopped. However, the spacecraft is designed equipped with Double-Reaction-Wheel (DRW) mode software, and taking the advantage of it, the spacecraft resumed the attitude stability and has been operated normally. The project team is confident in accomplishing a series of scientific observation including sample collection scheduled during the proximity phase. The spacecraft is, as of August 12th, at about 35,000 kilometer at the very slow approach speed of 38 meters per second. This is peculiar to the low thrust rendezvous that has not ever been experienced. The spacecraft will turn off the ion engines at the distance of 3,500 km to the object leaving intentional residual approach speed of 10 meters per second that is scheduled decelerated via Reaction Control System aboard. And in the middle of September, Hayabusa comes to still with respect to Itokawa at the distance of 20 km, Gate Position. This shows the object conceived Itokawa moves amid stars and strongly suggests this is not a star but a kind of planet. The constellation over which the object is exposed is the Puppis between the Canis Major (Great Dog) and the Carina. Itokawa may not be seen toward that direction from Earth, but seen via radio toward the Sun, nearest of which Itokawa should be together with Hayabusa spacecraft. Itokawa seen from Hayabusa has increased quite rapidly its brightness up to the magnitude four. It draws loci of the Itokawa direction from Hayabusa. Where Itokawa was exposed is plotted against the star map. Any object whose orbit parameters are different from those of Itokawa should never have been photographed. This simply indicates what is actually exposed is sure to be the object we have sought so far, which is our target destination, Itokawa. Whenever the optical navigation is performed, the relative trajectory has been updated and this process results in the loci corrected, so that the Itokawa direction should coincide with what was predicted. The optical measurements were combined with the radio data obtained on the ground. This sophisticated process is so called a hybrid navigation technique. These results conclude we could successfully complete the hybrid navigation task. The final portion of the locus was not significantly corrected and this implies our predict has already been enough accurate to guide the spacecraft to Itokawa. The brightness intensity of the object conceived Itokawa is plotted along with exposure time. The predict curve of it derives from the shape and rotation parameters determined last year, when Itokawa flew close by the Earth. It is of great importance to notice that this object's light curve shows a beautiful fit for the predict. This indirectly proves that the object is Itokawa.